Sean Dyche admits he and his players have learned a great deal from their European experience. And he’s not ready for it to come to an end just yet. Burnley look to overturn a 3-1 first leg deficit tonight against Olympiakos at Turf Moor. Dyche accepts the Clarets are underdogs, but will look to get at the Greek giants from the off, and use the energy of a passionate home support. Asked whether he has enjoyed continental competition, he said: “I think I am enjoying it in an odd way. “The two legs is a weird one, you’ve lost but are still in it. “I’m fortunate to have time with top, top managers and they’re always saying they are still learning and picking things up, and sometimes the hardest thing to do is to do less. “To have the power to stand back and say let’s do less for a moment, trust the players, because they’re finding their feet as well. “That can be a tricky thing. You are tempted to tick every box you can and you have to say these are professional lads, they know the system, how we work, so let them deliver. 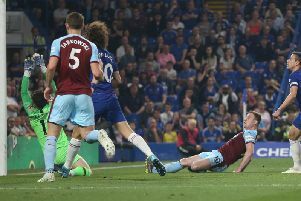 Whether coincidence or not, Burnley have only picked up a point from nine in the Premier League on the back of European ties, and Dyche accepts: “It’s not started as well as we’d have liked in the league, but what's affected which, or has nothing affected anything? It is very interesting. “There’s a negative noise over these early rounds of the Europa League. Players get bombarded with that. “Too many games, travelling, etc and some players can be affected by that. It only affects them until they are used to it. “Some clubs way bigger than us have gone into Europe and the first two or three times weren’t so good, it took them to learn about it, learning about travelling, different planning, different schedules. “In the Championship you know the challenge, but we’re talking different cultures and styles, not just the games. “If you’re a top side you will play about 60 odd games. But they knew the competition – this is all new to us. Burnley have the boost of an away goal, knowing a 2-0win or better would send them through, and Dyche spoke about their intentions: “You have to build a tempo and a feel in the stadium, which doesn’t often allow patience, you have to build a tempo to the performance. “On the other hand games can change quickly over 90 odd minutes, so you don’t need to score first minute. “Seize the fact you are underdogs in a European competition and use that as a strength and a power and take that challenge on. There will be a stadium of people wanting to do that. “I’m expecting the crowd to get behind the team like they do, Turf Moor under lights has been a special thing ever since I’ve been here. “To make it even more special you’ve got to deliver a performance. The Burnley fans often relish the underdog tag, and Dyche added: “We are underdogs, that’s factual and it will be the same on Sunday against Manchester United. After the controversy of the first leg, where Slovenian official Slavko Vincic gave a soft penalty and sent Ben Gibson off after coming under fire for denying two Olympiakos penalty claims in the first half, and giving one to Burnley, UEFA have appointed experienced Hungarian referee Viktor Kassai of Hungary, who was in charge of the 2011 Champions League final at Wembley between Barcelona and Manchester United. Dyche isn’t concerned who has the whistle, however: “We all question referees but that’s just a different side to it. They all ref different ways, different styles. “Maybe UEFA looked at reports and thought hmm, maybe not as good as what we hoped. “It’s a fine line for a manager. You have to question refs at the right times but also leave them alone to do the job. “I say the toughest three jobs are the two managers, liked or loathed, but refs often get questioned heavily. “I just tried to state facts about the game at Olympiakos.